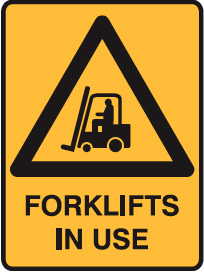 Unfortunately, forklift accidents can and do occur. There have been many reported accidents in the news as of late, which highlight just how important it is to ensure that all safety precautions are met when it comes to forklift management and warehouse management. Here are the latest stories that show how forklifts can cause serious damage to the people around them. Warehouse managers must make sure that they do all they can to avoid such injuries from occurring. Although these stories are from overseas, Worksafe Victoria reported that on average, about 250 people are still seriously injured by forklifts every year, and there are many more 'near misses'. How Can You Mitigate the Risk of Forklift Accidents? So it's obvious that forklifts can pose a serious risk to personal safety. The question is how can operations managers significantly reduce the chance of such accidents occurring? Managing such heavy duty equipment isn't easy - especially since forklifts need to be driven down narrow alleyways, in reverse, throughout the course of the day. In this case, there is no room for error. Facility managers have the responsibility of ensuring that their team is kept safe whilst at work and should always look to increase warehouse safety to avoid accidents. Modern improvements to warehouse equipment and access doors make it much easier nowadays to assist with keeping workers safe; for example, Movidor Integrated Traffic Lights implemented on Movidor High Speed Rapid Doors allow for forklift drivers, vehicles and pedestrians to clearly see when a door is in use and therefore avoid collisions. A relatively minor cost upfront (purchasing a set of LED Traffic Lights) can prevent huge costs in damage and time off work for injured workers not to mention compensation claims later down the line. Do the right thing!